Investing in green energy is one way Starbucks supports its aspiration of sustainable coffee served sustainably. Starbucks is the number one purchaser of renewable electricity in its sector on the Environmental Protection Agency's Green Power Partnership Retail Top 30i. Not only is Starbucks continuing to lead the way in purchasing renewable energy to reduce its environmental impact, the company is also being more regionally intentional with its approach by investing in local projects to directly support the markets where it has stores. This relationship with Cypress Creek and U.S. Bank is an example of that strategic approach at work. 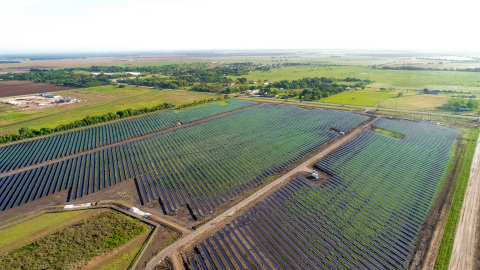 Starbucks is separately investing in six Cypress Creek-owned solar farms in Texas, representing 50 megawatts of solar energy. In total, the portfolio of eight projects announced today is reducing carbon emissions by an estimated 101,000 tons per year, the equivalent of planting nearly 2.5 million trees. "At Starbucks, we are proud of our 30-year legacy in environmental leadership as we know the planet is our most important partner," said Rebecca Zimmer, Starbucks director of global environmental impact. "Our long-standing commitment to renewable energy supports our greener retail initiative and demonstrates our aspiration to sustainable coffee, served sustainaly. Now, we are investing in new, renewable energy projects in our store communities, which we know is something our partners and customers can appreciate for their local economy and for the environment." "Cypress Creek is thrilled to join forces with Starbucks, U.S. Bank and Engie to provide a locally-sourced solar product to energize Starbucks Texas stores," said Matthew McGovern, CEO of Cypress Creek Renewables. "Starbucks and other forward-looking companies are carrying out their bold renewable energy targets, and Cypress Creek is proud to provide the innovative and tailored energy solutions needed to bring their vision to life." The U.S. Bancorp Community Development Corporation (USBCDC), the tax credit division of U.S. Bank, brought Cypress Creek and Starbucks together to facilitate the transaction and provided a portion of the tax equity investment. This is the second time Starbucks and U.S. Bank have worked together to develop and finance a solar project, having previously worked on a 47-megawatt solar farm in Maxton, NC that powers 600 Starbucks stores. "Starbucks is taking a unique approach - investing in solar farms regionally to support a specific group of its stores. This is a new concept and one that I think other companies are watching and may follow. It's an interesting model that allows them to talk specifically about the impact of their investments," Roetheli said. Cypress Creek believes solar makes the world cleaner and healthier. Our team successfully develops, builds and operates solar facilities across the United States. With more than 3.5 gigawatts of solar developed in more than a dozen states, Cypress Creek Renewables is one of the country's leading solar companies. For more information about Cypress Creek Renewables, please visit https://ccrenew.com. With $29 billion in managed assets as of Dec. 31, 2018, U.S. Bancorp Community Development Corporation, a subsidiary of U.S. Bank, provides innovative financing solutions for community development projects across the country using state and federally sponsored tax credit programs. USBCDC's commitments provide capital investment to areas that need it the most and have contributed to the creation of new jobs, the rehabilitation of historic buildings, the construction of needed affordable and market-rate homes, the development of renewable energy facilities, and the generation of commercial economic activity in underserved communities. Visit USBCDC on the web at www.usbank.com/cdc.